I just couldn’t resist… I was about to go to the shopping mall to buy some baking supplies, but oh well… they are having sale! I have already bought some cute cookie cutters and the most charming turquoise cake stand ❤ (you can actually see a glimpse of it here). 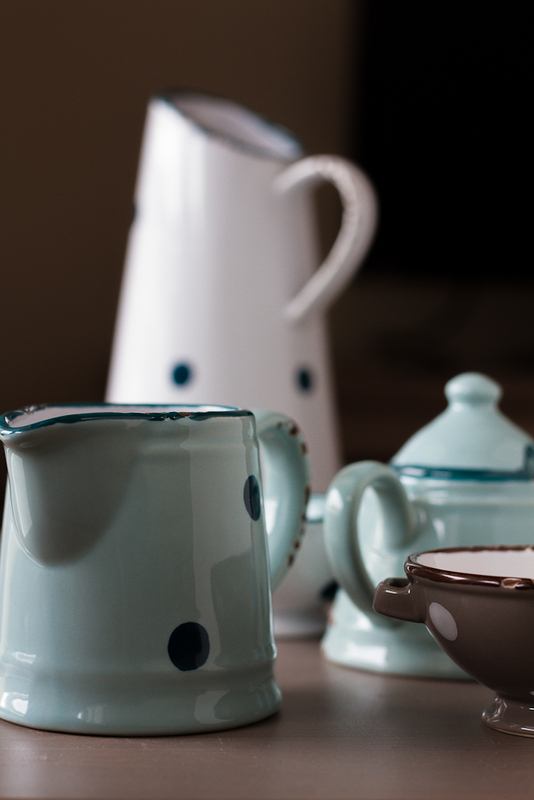 I was really not planning to buy something else than flour, butter and sugar… But my legs automatically brought me towards the crockery department and there they were: the cutest little dotted sugar bowl and milk jug! Strangely enough, I don’t own one yet, so I just had to buy them of course. And after all, nobody could have resisted this great discount 😛 I am even thinking of buying another big milk jug… would’t it be just sweet as a vase for some wild flowers?